including all Martz-authored molecular visualization projects. JSmol tutorials run immediately on computers, iPads, smart phones. Chrome, Firefox, or Safari recommended. Internet Explorer is too slow with JSmol! Edge is iffy. Jmol tutorials require Java: INSTRUCTIONS FOR ENABLING UNSIGNED JAVA APPLETS. These are gradually being converted to JSmol . An introductory level, nonlinear self-paced tutorial. Explanations with dynamic display of clashes during dihedral angle rotation. An introductory presentation suitable for lectures or individual study. NO Java. New: morphs of the R↔T transition, views of 2,3-diphosphoglycerate and polymerized sickle hemoglogin. The Major Histocompatibility Complex presents peptides from foreign proteins to T lymphocytes, crucial to disease immunity. Introduces cholesterol and phospholipids, then proceeds to lipid bilayer and the gramicidin membrane channel embedded within the bilayer. Includes molecular dynamics simulations of both gel and fluid membrane states. By Eric Martz and Angel Herráez. See 10 water molecules condense into a hydrogen-bonded droplet. Also liquid water and ice. Includes challenge questions for students. By Eric Martz and Angel Herráez. • Would you like to teach your students easy-to-use, state-of-the-art interactive 3D molecular visualization tools that they can expect to use for years to come? • Would you like to use such tools yourself	in your research? Check out the MolviZ Top 5! Carbohydrates, lipids, vitamins, proteins, and nucleic acids in JSmol in English or español, thanks to BioModel by Angel Herráez. Proteopedia.Org JSmol: Many excellent tutorials, and it is the easiest place to create and share customized molecular scenes, or molecular structure tutorials. Easy enough for student reports or homework assignments! See teaching strategies. Biology Collection for High School teachers. Create publication-quality figures, and animations ready to drop into Powerpoint. Easy enough for student reports or homework assignments! The Jmol Wiki has a list of Websites Using Jmol (at Jmol.Org). Van der Waals, uncharged, and ionic radii. Atoms sizes proportional to relative abundance in humans. MolviZ.Org brings together molecular visualization resources that Eric Martz has authored, coauthored, or recommends. These include interactive tutorials, software for molecular exploration, an Atlas with images and descriptions of selected macromolecules, physical teaching props, and more. Free, ready-to-use tutorials made with JSmol (NO Java required) or Jmol (requires Java). Help on how to make your own tutorials in JSmol (NO Java required). Exploration tools for molecular structure -- software that you can use to explore the molecules of your choice. An easy way to make publication-quality figures and animated molecules for Powerpoint slides, suitable for professionals, yet easy enough for student reports/homework. Tutorials at Proteopedia, Biomodel, etc. ConSurf Server: see evolutionary conservation. 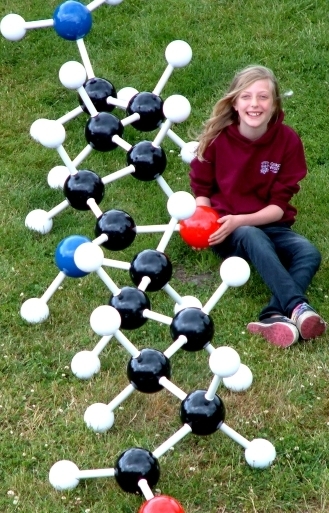 HighSchool.MolviZ.Org includes interactive molecules selected for high school curricula, alphabet traits fingerprinting, instructions for making DNA earrings, instructions for making molecules from balloons, and much more. Pre-selected molecules with descriptions to place them in context. DNA, antibody, HIV protease with inhibitor, hemoglobin, lipid bilayers and channels, and more. Introductions to structures of carbohydrates, lipids, vitamins, proteins and nucleic acids from BioModel by Angel Herráez. Both English and español versions of guided tutorials on DNA, carbohydrates, lipids/bilayers/channels, vitamins, proteins, and nucleic acids. The Atlas of Macromolecules is extensively illustrated. 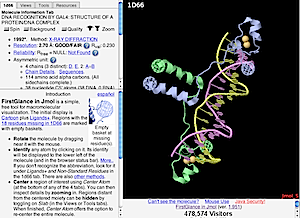 Every entry in the Atlas can be displayed in FirstGlance in Jmol, and many in Proteopedia (neither of which require Java). Updated in February, 2016, with animations of the ribosome, proteasome, hepatitis B virus capsid, and new sections on intrinsically disordered/natively unstructured proteins, NMR ensembles, and amyloids. Organized by categories including enzymes, structural proteins, calcium-binding proteins, lipid bilayers, integral membrane proteins, myristoylated proteins, DNA, RNA, virus capsids, toxins, carbohydrates, magnificent molecular machines, unusual tertiary/quaternary structures, etc. Presentation-ready animations can can be saved from FirstGlance. Here are Examples. FirstGlance in Jmol (firstglance.jmol.org) enables you to explore any molecule using menus and buttons, without learning any commands, and with nothing to install (Java is optional). It works immediately with all popular browsers and computer types including recent iPads and smart phones, and is used for the 3D View links in the journal Nature, among others. FirstGlance in Jmol offers numerous one-click preset views, makes it easy to hide portions of the molecule, find residues by sequence or name, show all protein disulfide bonds, salt bridges and cation-pi orbital interactions. Its Contacts.. dialog shows non-covalent bonds to any target moiety that you select by clicking, dividing them into seven categories that you can hide or display with checkboxes. ConSurf output: Conservation of the catalytic pocket of enolase (4enl), an enzyme in glycolysis. See evolutionary conservation! Introduction to Evolutionary Conservation. ConSurf makes it easy for you to identify functional regions of proteins. Each amino acid is colored by evolutionary conservation, thereby revealing conserved or highly variable patches. Results may be displayed in FirstGlance in Jmol or other viewers. Given a 3D model or PDB code this user-friendly tool finds related protein sequences, performs multiple sequence alignments, constructs a phylogenetic tree, and assigns a conservation level to each amino acid, all automatically! Optionally, you can select the sequences and upload your own multiple sequence alignment, which will be used by ConSurf's state-of-the-art algorithms, all of which are published in peer-reviewed journals. Toobers are inexpensive, easy to bend, foam-covered rods that hold the shapes you give them, over and over again! They are very useful in illustrating macromolecular structure concepts. Great for all levels of science from K-12 to undergraduate. We feature several examples and also short movies to illustrate their use. Colorful, accurate models featuring embedded magnets to simulate hydrogen bonding, at varying prices—kits for water, for assembling DNA from nucleotides (image at right), and other molecules. Available for purchase from 3DMolecularDesigns.com; several available to local teachers through the Physical Model Lending Library (Western MA USA only). For information on how high-precision models are made, see the Rapid Prototyping section of History of Visualization of Biological Macromolecules. To reserve models, and for more information, see the Lending Library for Physical Molecular Models for Western Massachusetts, USA. Make Publication-Quality Molecular Images and Rotating Powerpoint Slides Easily! FirstGlance in Jmol is the easiest way to make high quality images and presentation-ready animations. See Examples. However, FirstGlance does not support customization of colors and rendering in the molecular view. Also the images generated by Jmol in FirstGlance are not quite as high quality as those generated by PyMOL. Polyview-3D generates its images and animations at truly publication quality using PyMOL. Furthermore, it supports full customization of the molecular view. Molecular Sculpture by scientists, artists, and artist-scientists are highlighted in this collection. Julian Voss-Andreae's Alpha Helix for Linus Pauling (photo used with permission). 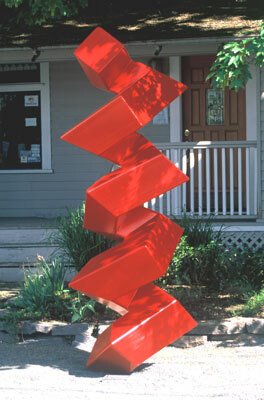 The 10-foot (3 m) sculpture was created to honor the memory of Linus Pauling, who discovered the alpha helix in 1951. The sculpture is located in front of Linus Pauling's boyhood home in Portland, Oregon. The History of Visualization of Biological Macromolecules answers questions such as, Where did MDL Chime come from? What about Fred's Folly and Byron's Bender? See early computer images, physical models including the latest by computer-driven laser-powered rapid-prototype engineering, and the latest molecular sculpture. Visitors since June 19, 2002. Stats. Click the count above for graphs of visiting rates, browsers, operating systems, etc. Thanks to Frieda S. Reichsman (MoleculesInMotion.Com) for improving the organization and design of this site in 2005, and for subsequent insightful feedback.